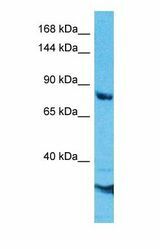 CAF1 antibody LS-C480306 is an HRP-conjugated rabbit polyclonal antibody to human CAF1 (CHAF1A). Validated for WB. CHAF1A / CAF1 antibody was raised against synthetic peptide directed towards the C-terminal region of Human CAF1A. Western blot of CAF1A Antibody with human HepG2 Whole Cell lysate. This image was taken for the unconjugated form of this product. Other forms have not been tested.